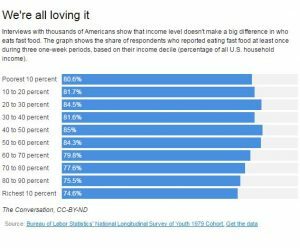 Who eats more fast food the poor or wealthy? Data helps us understand the world as it really is as opposed to what we think is true. The article Do poor people eat more junk food than wealthier American? uses the Bureau of Labor Statistics longitudinal data, accessible in the article, to answer the question. Because it’s considered relatively inexpensive, there’s an assumption that poor people eat more fast food than other socioeconomic groups – which has convinced some local governments to try to limit their access. Read the article to learn more and take advantage of the data sources for statistics or QL courses. In the last four months of the Obama administration, September to January, there was a gain of 1,400 jobs. In the first four months of the Trump administration, there has been a gain of 1,000 jobs. While not part of the article, the graph here from the BLS is seasonally adjusted coal mining jobs since 1985. 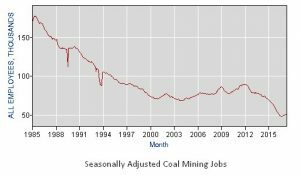 Interestingly there was a drastic decline in coal mining jobs from 1985 until about 2000. Most countries score an F on our LGBT human rights report card is a recent article in The Conversation. 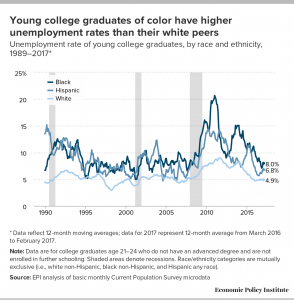 The article includes three charts with data that can be used in a statistics or QL based course. There is also a link to the related paper, Human Rights and the Global Barometer of Gay Rights (GBGR): A Multi-Year Analysis, that describes the methodology used in the rankings. Glaciers are sentinels of climate change. Ice that took centuries to develop can vanish in just a few years. A glacier doesn’t melt slowly and steadily like an ice cube on a table. 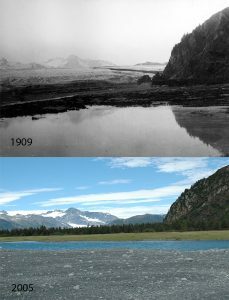 Once glacial ice begins to break down, the interaction of meltwater with the glacier’s structure can cause increasingly fast melting and retreat. Widespread loss of glaciers would likely alter climate patterns in complex ways. Glaciers have white surfaces that reflect the sun’s rays. This helps keep our current climate mild. When glaciers melt, darker surfaces are exposed, which absorb heat. This raises temperatures even more. Young graduates are burdened by substantial student loan balances. There is an abundance of information and data in this report that can be used in math or QL based courses. A recent NASA report Alaska tundra source of early-winter carbon emissions provides another example of a feedback loop. Global warming has slowed the refreezing of the Alaska tundra allowing for increased CO2 releases. 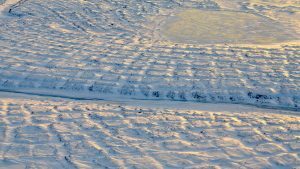 A new paper led by Roisin Commane, an atmospheric researcher at Harvard University in Cambridge, Massachusetts, finds the amount of carbon dioxide emitted from northern tundra areas between October and December each year has increased 70 percent since 1975. A NASA report notes that April 2017 was second-warmest April on record. 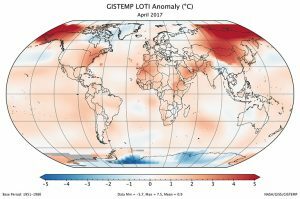 April 2017 was the second-warmest April in 137 years of modern record-keeping, according to a monthly analysis of global temperatures by scientists at NASA’s Goddard Institute for Space Studies (GISS) in New York. Last month (meaning April) was 0.88 degrees Celsius warmer than the mean April temperature from 1951-1980. The two top April temperature anomalies have occurred during the past two years. If you like the cool map here that was in the NASA report you can make your own for various time period at Global Maps from GHCN v3 Data. This is a great app and can be used for discussions about means vs distributions in stats or QL classes, for example. The article also has links to data sources. 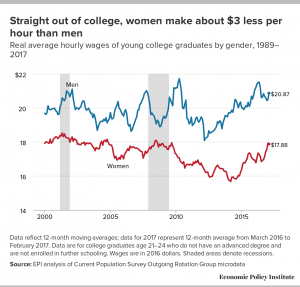 A recent EPI report notes: Straight out of college, women make about $3 less per hour than men. Right out of college, young men are paid more than their women peers—which is surprising given that these recent graduates have the same amount of education and a limited amount of time to gain differential experience. What may be worth exploring is the historic difference in starting pay between women and men, which you can do since the data is available and can easily be placed into Excel. Project MIDAS recently posted Larsen C takes another step towards calving. 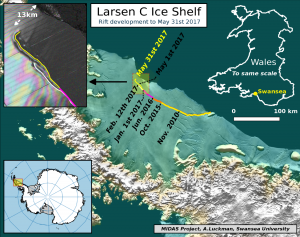 In the largest jump since January, the rift in the Larsen C Ice Shelf has grown an additional 17 km (11 miles) between May 25 and May 31 2017. This has moved the rift tip to within 13 km (8 miles) of breaking all the way through to the ice front, producing one of the largest ever recorded icebergs. The rift tip appears also to have turned significantly towards the ice front, indicating that the time of calving is probably very close. STEM folks are presented with challenging problems modeling and predicting changes in ice and glaciers due to climate change. A recent Economic Policy Institute report, “Competitive” distractions – Cutting corporate tax rates will not create jobs or boost incomes for the vast majority of American families, provides some useful data and charts. 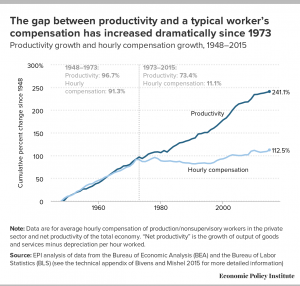 For example, the graph here compares changes in productivity and hourly compensation (Data are for average hourly compensation of production/nonsupervisory workers in the private sector and net productivity of the total economy. “Net productivity” is the growth of output of goods and services minus depreciation per hour worked.) You can download the data which can be used for linear regression. There are other graphs in the article with data that can also be used. We find their central argument—that U.S. corporations face high corporate taxes—to be empirically false. While U.S. statutory tax rates are higher, the effective tax rate paid by corporations is in fact roughly equivalent to the effective tax rates of our peer countries, due to loopholes in the U.S. tax code.